People's Choice BRONZE Medal Hunahpu's Day 2016 The Professor was dating both Ginger and Mary Ann. Gilligan was tired of dating pineapples and wanted to impress the only woman available. 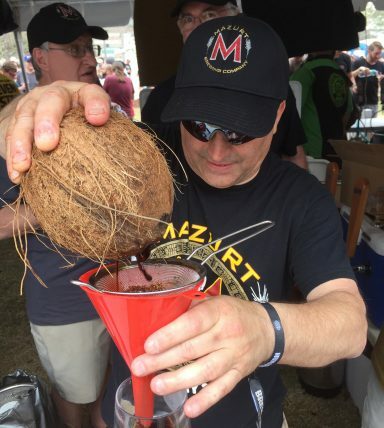 It was Gilligan’s brilliant idea to age MAZURT in actual coconuts. In the end…Mrs. Howell agreed. Brewed with Deep Roasted Kenyan Coffee, VT Grade B Maple Syrup, Madagascar Vanilla, Peruvian Coco Nibs, and Georgia Wildflower Honey. Our Brandy Barrel Vanilla Russian Imperial Stout was then historically aged in dozens and dozens of this seasons finest hand-selected Dominican coconuts.